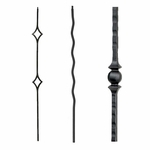 Largest Selection Of Stair Balusters. Order on-line Today. 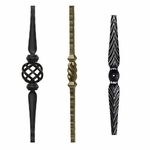 We have spent the last 15 years sourcing the finest iron balusters from Italy and China. These iron balusters are powder coated (for durability of finish) with the most popular colors available. 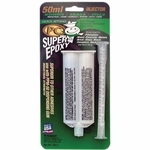 We believe they are by far the best in the market and we have over 75 options to choose from. 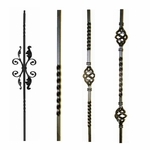 And we have New Iron Balusters on-line every year. Just take a look at these beautiful iron spindles and I'm sure you will be impressed. We always guarantee the best stair parts pricing on the internet. We can offer this because we buy so many stair parts that we can pass along the savings to you. And as the owner of the company, I can offer you an on the spot price. We also offer Free Shipping*. 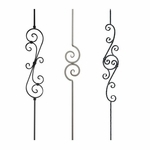 It's tough for the consumer to gauge shipping on iron balusters as they are so inexpensive but very heavy. So, we make it easy on you and offer Free Shipping on all orders over $49.00*. We at Stair Warehouse know just about everything there is to know about Iron balusters and can answer your questions immediately. Please call anytime or email me for help. 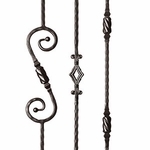 Almost all of our iron balusters are in stock and ready for immediate shipping via UPS. We usually pull the balusters and ship from our warehouse in 2 days. *Free shipping offer does not apply to any products over 7' in length. We do not ship outside the continental U.S.
New Italian powder coated Wrought Iron Balusters and un-finished metal balusters on sale and ready for immediate shipping. Still trying to decide on what color? 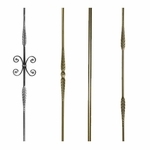 Order an iron baluster color sample pack by clicking here: Iron Baluster Color Sample Pack. Feel free to send us a picture of what you want or simply browse our picture gallery for ideas. Every member of the Stair Warehouse staff is well trained in staircase design and more than happy to help with any of your questions.